From November 21 to December 12, 2014, I traveled to Peru. It was a tremendous opportunity to learn, reflect and understand the context, ground realities, and examples of inspiring grassroots activism and strategies for social change. Led by indigenous communities, women, youth and the civil society movement, Peru is home to a dynamic civil society. Peru is an Andean country, rich in both indigenous culture and natural resources, and is at a crucial point in strengthening its civil society. After being discouraged to organize any type of activism during the era of ‘political violence,’ grassroots groups have slowly rebuilt their confidence to now strengthen their mobilization efforts to improve local livelihoods, and strengthen indigenous leadership. The Agrarian Reform law in 1969 abolished large estates that concentrated land ownership, eliminated semi-feudal relations in rural society, and adopted new ways of agriculture production. Simultaneously, the Agrarian Reform law referred to indigenous communities as peasant farmers, leading to devaluing the indigenous identity. Today, small-scale peasant farmers produce the bulk of Peru’s food, but their productivity remains low due to inadequate government support. In order to strengthen small-scale farmers, and revive indigenous identity, six indigenous social movements have come together to form an alliance called the Pacto de Unidad or the Unity Pact to draft policies towards self-determination, and that promote Buen Vivir or “well-being,” a way of doing that is essentially community centric, ecologically balanced and culturally sensitive. Amongst the members are the National Organization of Indigenous Andean and Amazonian Women of Peru (ONAMIAP), and the National Federation of Women Peasant Farmers, Artisans, Indigenous, Native and Salaried of Peru (FEMUCARINAP), two social movements founded in the last decade to highlight the enormous role women play in food sovereignty and climate change, and provide them with leadership opportunities. Former president Alberto Fujimori was elected in 1990 under promises not to implement structural adjustment policies, but barely two weeks after his inauguration, he instituted an economic shock program that later came to be called “Fujishock.” Overnight, the prices of critical goods and services soared. Prices of bread and milk tripled. The cost of noodles and newspapers quadrupled. And the price of cooking gas increased 25-fold. Those affected the most were women and children. The enormous rise in prices of basic commodities made it tremendously difficult for poor women. Diseases spread in the growing slums, even as purchasing power deteriorated, structural adjustment policies further reduced wages, and subsidies were scaled back. In this harsh context emerged the Gender and Economy Group (G&E). Founded in 1992, G&E was a collective composed of women and social organizations committed to constructing an alternative vision for a social and solidarity economy, with a lens of gender equity and social justice. G&E is part of REMTE (Latin American Network of Women Transforming the Economy) and is the World March of Women’s Peru chapter. In general, Peru’s economic model relies heavily on extractive industries, especially the mining industry, for exports, private investments and its tax revenues. The Ministry of Energy and Mining (MEM) estimates that in 2014, there were about 52 megaprojects in Peru, exploiting three metals: copper, gold and steel. Main investors come from China, the US and Canada. Since its founding, CooperAcción, a local organization, has been accompanying local communities to make rising social conflicts catalyzed by these mining/extractive industries visible. It’s urealistic that the mining industry cease to exist in Peru. In fact, there are local communities who want to own and generate their local economies through alternatives like artisanal mining. CooperAcción has worked together with local communities to find ways to manage small-scale artisanal mining, with a fair trade and environmental lens. In the early 1980s, Peru entered a violent socio-political context, where the Shining Path, a Maoist guerilla insurgent organization launched an internal conflict, with a stated goal to implement a “New Democracy” – a decisively distinct path from that of the liberal capitalist and parliamentary democratic systems in the western world, and the Soviet-style communism that prevailed in Eastern Europe. Indigenous peasant communities suffered the most during this period, that lasted until 2000. In particular, youth and children became vulnerable, and unprotected as they either became orphaned or driven out of their homes. Displaced from their own homes, many indigenous people were forced to deny their culture and language, in order to find safety in urban Peru. In this harsh backdrop emerged comedores populares, a strategy through which women in the neighborhoods shared food, acquired donated food, and cooked meals for the general public. 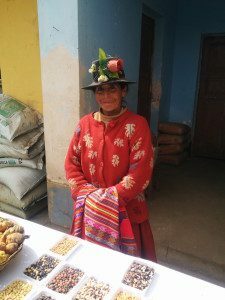 Chirapaq, an indigenous organization, was founded in 1986, as a center of indigenous cultures, to implement the “comedor popular” strategy in Ayacucho, to not only feed the people, but it also revived indigenous Andean cuisine, and helped build a nutritional diet for children. Chirapaq also started a traditional arts program for youth and children to build their self-esteem, and have a space to express and heal their pain and re-value their indigenous identity. 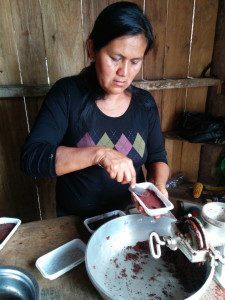 The programs have evolved to now include indigenous-led means of communication, and strengthening relationships between indigenous Andean and Amazonian women. It was heartening to connect with such shining examples of grassroots solutions towards self-determination, and dignified livelihoods, amidst a harsh neo-liberal economic paradigm that constitutes Peru’s current socio-economic context. It was also clear that indigenous women’s leadership and resilience is not just at the heart of true socio-economic change in Peru, but also the way forward for a country facing the wrath of climate change.